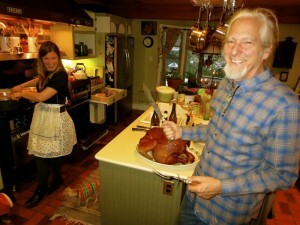 Stuart “harvested” the turkey from his farm and smoked it on his Big Green Egg. Greetings and good wishes for 2014! Last Thursday our band of revelers headed to the country for an old-fashioned family Christmas hosted by Shirley and Stuart at their charming farmhouse. The guest of honor was one large turkey sacrificed the day before for the feast, then smoked outdoors on a Big Green Egg (any smoker would have done the job). As prelude to the feast, Lucy made a decadent lobster bisque and it occurred to me this would be quite special to ring in the New Year as well. Not a morsel of lobster goes to waste in this recipe; as the instructions explain, the water used to boil the lobsters, juices and roes emitted when shelling, and even the shells themselves are used to make the flavorful base. Typically one would find 2-3 morsels of lobster in a bisque (which is to be expected with the price of lobster so dear), but this bisque was loaded with the sweet, succulent meat. 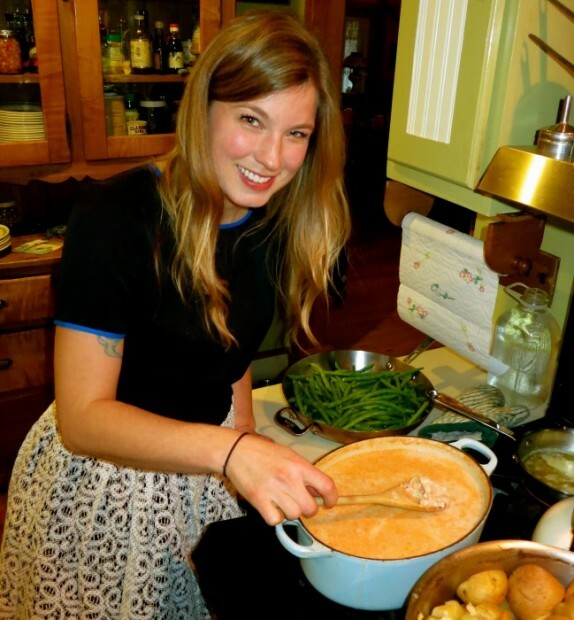 Seafood stews are so perfect for wintry, celebratory meals – Oyster Stew , Sherried Shrimp Bisque, Cioppino and Bouillabaisse are other favorites of mine. The batch was loaded with lobster meat. Preparing this Lobster Bisque is very similar to cautions I take with Oyster Stew; the only ways to befuddle your efforts would be overcooking the lobster and/or allowing the cream base to overcook and possibly separate. A heavy bottomed pot (a Dutch oven is perfect) and a riser to insert over the burner keeps the soup from becoming overheated. The soup yielded 20, 1 cup portions, which was the perfect amount when served as an appetizer. I’d estimate it would yield 8 main course servings, and is easily divisible. Lucy explains the flavor of the bisque improves after a day’s confinement in the refrigerator. Fill half to three-quarters of your largest pot with water. Add bay leaves and lemon and bring to a rapid boil. Boil the lobsters, in batches if necessary, about 6 minutes, or until they are bright red but not cooked all the way through. Save cooking liquid and set aside. When lobsters are cool enough to handle, de-shell the meat over a large bowl so you are catching all the juices that come out of cracking them. Reserve drippings and shells; this is most important. If there are any roe sacks present (they are DARK GREEEN, not the pale green goo called the “tomalley”), set aside for later. The roe might appear slightly pink around the edges if it has been exposed to heat, but it is mostly very dark green. Cut meat into bite-sized pieces and set aside. To make a stock, in your largest sauté pan, heat half of butter over medium heat and sauté shallots. When translucent, add as many of the large pieces of reserved lobster shell as will fit in the pan and sauté the shells until brownish on their edges and very fragrant. Add sherry and reserved drippings, thyme, tarragon and the water the lobsters were cooked. Raise heat and reduce for about 15 minutes, checking for flavor; seasoning to taste with kosher salt and freshly ground pepper. Strain the stock with a fine strainer or cheesecloth. In a heavy-bottomed pot or Dutch oven, melt remaining butter and sauté any reserved roe, breaking it up into very small pieces with your spoon until it is bright red. Add stock to the pot, bring to a nice heat, but do not boil. Take a few ladles of the hot stock and pour over reserved lobster meat, then stir in cream over lobster. (This warms the lobster without shocking it into toughness and prevents the cream from separating.) 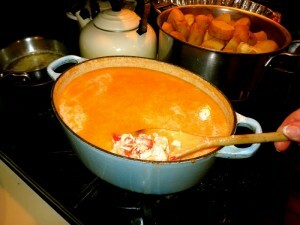 Combine the lobster/cream mix with the warm stock in the pot and remove from heat. Add Tabasco to taste, if using, and refrigerate overnight. When reheating, DO NOT BOIL. The cream easily breaks and you will be very sad. You must warm very gently over low, low heat, stirring consistently. It’s so simple, but so luxurious! Wishing you a happy, healthy, and very blessed new year, Peggy!!! New Year’s does seem like the perfect time to enjoy something as decadent as lobster bisque.